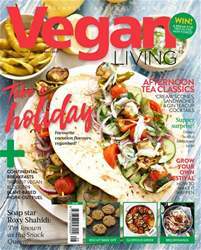 This issue we're in holiday mood and we’ve recreated amazing vegan versions of far-away favourites for you to make at home, from a zingy Cypriot souvlaki to glorious Italian gnocchi. Best served at a wooden table with a glass of chilled rosé. The holiday mood continues with our seasonal suppers, straight from Greece, and an elegant afternoon tea, perfect to serve to friends in the conservatory. Don’t have a conservatory? Gin teacup cocktails will work just as well at the kitchen table! 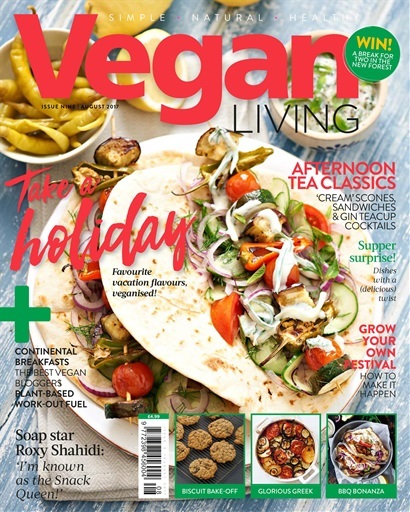 We’ve also dived deep into the world of vegan festivals, and found out exactly how to start your own, plus we have the tastiest recipes for your barbecue — the aubergine gyros are a winner. We love bloggers at Vegan Living — they’re often the people with the most innovative recipe ideas, and the most stylish photography, so we’re delighted to showcase vegan recipes from a new book featuring the work of the best modern food bloggers, while our own blogger of the month shows you how to make some very crowd-pleasing lemon cupcakes. All that and a relaxing jaunt to Portugal, where to eat out and some very Italian breakfasts. Wherever you go and whatever you eat this month, enjoy the holiday mood!